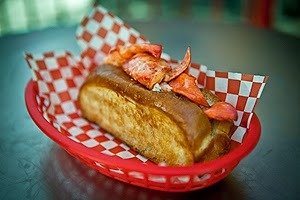 Chicago’s lobster fans will have another great team to cheer for on June 5 when Da Lobsta’s team of lobster roll craftspeople competes in the 5th annual Lobster Rumble in New York City. This culinary showdown, hosted by Tasting Table, features 24 of the country’s top seafood restaurants that will all be competing for top honors. Proceeds benefit Share Our Strength. "We are very proud to be a part of this great event," said J Wolf, owner and founder. "We will face off against some formidable competition from across the country, but we’re confident that our passion and creativity will put us in the hunt for the title." If Da Lobsta’s stature can be measured by its fellow competitors in the Lobster Rumble, it’s considered among the elite. Other contestants include B&G Oysters from Boston; Betony from New York City; Eventide Oyster Company from Portland, Maine; the Dock & Roll Diner from Austin, Texas; Roberts Maine Grill from Kittery, Maine; Thames Street Oyster House from Baltimore; the Clam Shack from Kennebunkport, Maine; L&W Oyster Company from New York City; the Mermaid Inn from New York City; the Ordinary Fancy Seafood Oyster Hall from Charleston, S.C.; Macchialina from Miami; Lobster Joint from New York City; Lure Fishbar from Miami; Luke’s from the New York City and Washington, DC areas. Tickets for Lobster Rumble in New York City can be purchased online; VIP tickets are $265 per person, and general admission is $165 per person. Tickets include unlimited visits to 24 lobster stations and open bar, from 7-10 p.m. VIP tickets include the VIP lounge from 6-7 p.m.